Ideal For Behind Log Burners & Inside Fire Places. 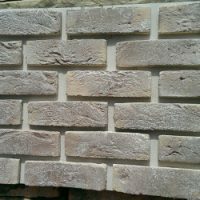 We Take A Cement Panel & Mount Our Pre-Cast Brick Slips. You Simply Screw Fit The Panels, Bond Any Linking Brick Slips & Then Point. Our fire inserts & panels are manufactured in the UK and tested to BS4551 Pt1 and freeze thaw stability ASTM C67. These panels can be used with SIPS, timber frame, ICF and conventional block builds giving the appearance of hand laid brick walls but with the convenience of speedy installation and the benefit of huge cost savings. 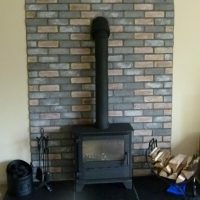 Ideal for behind log burners and inside fire places we take a cement panel and mount our pre-cast brick slips. You simply screw fit the panels, bond any linking brick slips and then point. We can pretty much design these panels to your specifications. This product is a high-performance interior and exterior brick panel system for residential, commercial and industrial projects. The brick slip panels are water, frost and heat resistant and since the brick slips are made from reconstituted stone they will not ‘blow’ like traditional clay bricks are prone to. A typical tradesman can fit around 8m2 of loose brick slips a day. With our brick panel system this could be as much as 40 m2. If you factor in this rapid fitting time the panels are very much a cost-effective option. Once the panels are secured to a wall the brick slip facings are grouted. This means there are no visible joints. Our fire brick slip panels can withstand temperatures ranging between -40 to 150 degrees celsius therefore, are suitable behind log/wood burners, gas and electrical fires as well as external use in new builds or property face lifts. (18 boxes or 16.2 m2 of panels on each pallet delivery).